2016 saw the Fantastic Fireworks team complete its fifth year at the Isle of Man TT and what a five years it has been. Five top quality shows, and one of them even fired 24 hours early, something that was not accounted for in the planning! Sitting in the ferry terminal in Liverpool making phone call after phone call to bring plans forward 24 hours is not something we’d recommend but the whole team went above and beyond, stepping straight off the ferry and doing a night shift to beat the incoming inclement weather expected over the weekend. The result was a top class show and a very happy client. With the Isle of Man some 80 miles off the English coast logistics are always a challenge when your show and crew arrive at different times in different ways. The show itself, fireworks and all kit, has to be loaded into a container and shipped by a freight ferry from Liverpool. The crew meet from various corners of the UK on Liverpool Waterfront to board the Sea Cat ferry direct into Douglas Harbour. Even this can be problematic, especially when one member of the crew stood at the tradesman’s entrance until 5 minutes to gate closure! The show takes place on a 30-metre barge moored some 300 metres out in Douglas Harbour bay. This involves a 2-day rig and close liaison with the harbour master over weather conditions. If the wind is much over 20 knots the barge can’t be towed. Fortunately we have been very lucky in having a 100% success rate. 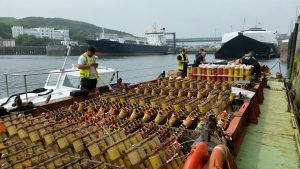 With all the hardware installed the day before, our crew splits into teams of two across the barge to ensure slick and efficient loading and plugging in of the fireworks and their connectors. By 4pm the team is about ready to hand over for testing. In a typical scenario three cues from the entire display will have faults .. all in a localised area and resolved by moving the orange igniter sleeve from the pin clamp. Getting 100 per cent green light connectivity is always the pinnacle of the two days of hard graft. With showtime usually around 10.45pm the firing crew set sail at 10.15 , two in the tug boat and another in the trail boat. These are used to stabilise the barge. Once positioned at the marker buoys, we’re ready to go. Bang on time the client will give the nod and we’re off. The display is a visual feast of sequences building to peaks several times throughout the 12-minute display. Once the skyfilling finale has faded our greatest satisfaction is when the client turns around with that smile that needs no words.